Check out the SoundGirls.Org website’s About Us page and you’ll see their unofficial mantra: “You Can’t Be What You Can’t See.” It is the organization’s mission to “inspire and empower the next generation of women in audio” by shining a light on women who are living it, every single day. Founded in 2013, SoundGirls is dedicated to fostering community as well as providing tools, knowledge, and support to individuals who are actively building careers in audio, sound, and music production. When we reached out to Karrie Keyes, the executive director and co-founder of the organization, and asked her to describe her role to us, she responded: “As Executive Director, I work with our co-directors and our chapter heads on developing programs. 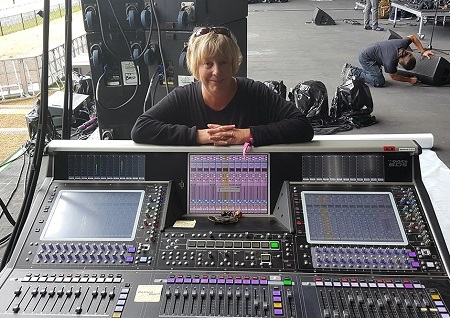 I oversee the day to day of running the non-profit and work with our volunteers to keep things running.” That’s no small feat considering that SoundGirls now boasts an international membership of more than 6,000 members with dozens of chapters worldwide. Also, never mind the fact that Keyes already has super important job —as the monitor engineer for Pearl Jam and Eddie Vedder — a post she’s held for the past 28 years! Since starting out in L.A’s punk circuit during the 80’s under the mentorship of Dave Rat of Rat Sound, Keyes has worked with an array of bands and artists including The Red Hot Chili Peppers, Sonic Youth, Fugazi, and Neil Young. We caught up with Keyes at The 2019 NAMM Show to learn more about SoundGirls and some of the issues women in audio are facing today. Your “Guide to Supporting Women in Sound” shares this bit of advice: “Don’t comment on someone’s gender, take interest in their work.” Why is commenting on someone’s gender before you learn more about their work probably not the best approach? How did SoundGirls come about in the first place? What prompted you to found the organization? What would you like girls and women who are considering a career in audio, sound, or music production to know? Do you hope STEAM will lead to more females entering audio? *Note: STEAM is an acronym for Science, Technology, Engineering, Art & Mathematics. What can studio owners and managers do to make their work environments more inclusive?